Anyone who wants to be eye-catching at the point of sale is outstanding with the innovative kiosk solutions from friendlyway. Whatever the concept of a kiosk system in your home, we can provide you exactly with the equipment you would like in this area. Take your chance and be inspired by our numerous top offers. We are sure that we have met your and the taste of your customers. According to experience, customers often decide on the spot, which product is to be purchased. 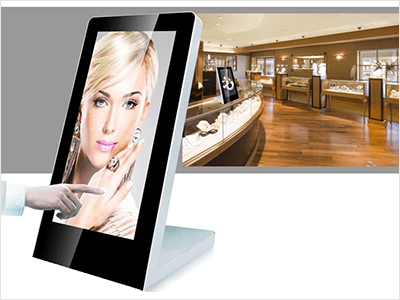 If the trading company is addressing the project customer approach in a targeted way, our high-quality kiosk solutions help the customer to be approached. If the product is also presented with excellent image reproduction, the end customer has left a lasting impression. The use of state-of-the-art technology and a trendy design should not be underestimated in the product presentation with a kiosk system. If the respective product is illustrated and illuminated in bright images, this is already interesting for many and you are looking forward. And this opportunity should be used by companies at the point of sale. Once the interest has been aroused, you are happy to stand by and look at the advertised product more closely. Check out our website and check the kiosk category to see which systems are right for you. We are extremely flexible in this area and at any time able to realize your wishes in terms of displays, applications, software and/or housings. The bandwidth of our kiosk solutions is enormous. If you would like to install a versatile self-service terminal for your company, we will surely find the right device for you. Even years ago, public institutions and banks have discovered and supported the benefits of kiosk solutions. If you would like a detailed consultation on this, we are gladly there for you! Please call us or send us your request by e-mail.